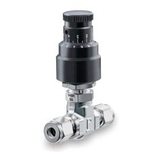 The Parker NS Series of metering valves are designed to provide accurate and stable control of flow rates in analytical, instrumentation, and research applications. A variety of connection sizes, body patterns and materials of construction provide considerable application versatility. 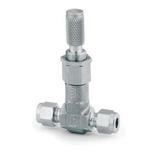 For higher flow rates, refer to the NM and NL Series of metering valves. 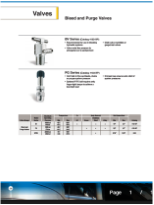 The Parker NM and NL Series of metering valves provide higher flow rates than the NS Series of metering valves and retain most of the features found in the NS Series. 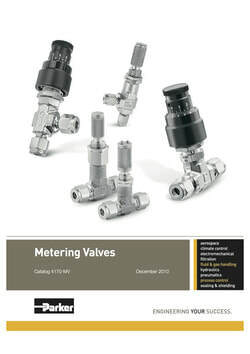 Parker HR Series Metering Valves provide the highest degree of precision metering for moderate pressure applications. A choice of seven precision ground, tapered fit, non-rotating and non-rising valve stems enable repeatable metering at flow capacities as low as 0.0004 CV. With 15 stem turns, this valve offers the ultimate in precision flow control. This series also features shut-off capability not found in most metering valves.